This was a good basic overview of the history of feminism in America - not an in-depth exploration, to be sure, but a nice jumping off point for people who are new to this, and a good place to find out the names of people and movements to research more. However, this book is NOT a "graphic history" - it's a book of text with occasional line-drawing illustrations sprinkled in. 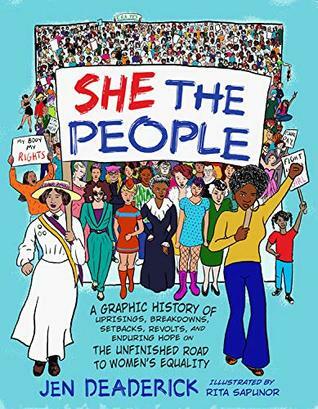 I went into this expecting a graphic novel (a la John Lewis' "March" or Marjane Satrapi's "Persepolis") and was a little This was a good basic overview of the history of feminism in America - not an in-depth exploration, to be sure, but a nice jumping off point for people who are new to this, and a good place to find out the names of people and movements to research more. However, this book is NOT a "graphic history" - it's a book of text with occasional line-drawing illustrations sprinkled in. I went into this expecting a graphic novel (a la John Lewis' "March" or Marjane Satrapi's "Persepolis") and was a little disappointed. Jen Deaderick - History has always been a passion of mine. I stop to read plaques. My mother was deeply involved with the League of Women Voters during the push for the Equal Rights Amendment in the 1970s, and she made sure I knew about my foremothers. It's because of her that I ended up writing She The People. Ten years ago, I founded an Equal Rights Amendment page on Facebook in the hopes of renewing interest. My interactions on and around the page made me realize how little people actually knew about not only the ERA, but also how citizenship and democratic process works. That made me want to tell the story. My Mom grew up in veterans housing in Winthrop, Massachusetts on Boston Harbor. My Dad grew up in the Bronx. I grew up as a stealth Townie in a gentrifying working class neighborhood in Brookline, Massachusetts. The brilliant teachers at Brookline High School taught me how to write and that just keeps paying off. I will always be grateful that I had access to excellent public education. I got my BFA degree in theater from Emerson College in Boston after an unsuccessful year at Grinnell College in Iowa and a gap year spent trying to figure myself out in San Diego and Europe. That travel was funded with a cashed-out $2000 mutual fund that my Dad had started for me at some point. Thanks, Dad. After graduating Emerson, I moved to NYC where I took a half-hearted stab at pursuing acting, and then ended up doing stand up comedy, which was fantastic. I made money temping, then consulting, which pays more and involves less Xeroxing. I was in NYC for nine years, and then moved home to Boston to marry and have a kid, not necessarily in that order. I now have an amazing 14-year-old and a decent ex-husband. I live in Cambridge with my kid surrounded by hipster cafs and intellectuals.